EWT-11-0652 is a narrow bandwidth cavity filter with a passband from 460-465 MHz. Insertion loss over the pass band is <1.5 dB and has >55 dB rejection at 455 MHz. VSWR over the pass band is 1.5:1. 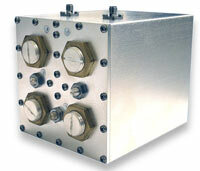 This unit is designed to withstand 100 Watts CW. Supplied as shown with SMA Female connectors, however other connector options are available. Contact Us Today or call us at 410.749.3800 to see how Eastern Wireless TeleComm, Inc. (EWT Filters) can help your meet your customized needs today.